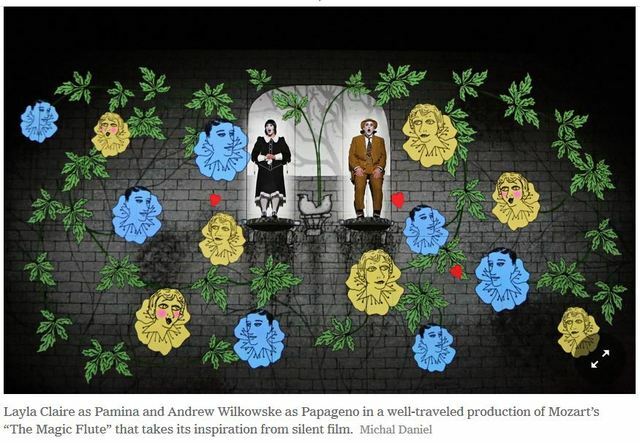 An innovative, well-traveled production of Mozart’s “The Magic Flute” that takes its inspiration from silent film will finally come to New York. A new Mark Morris dance, “Sport,” set to Satie’s “Sports et divertissements,” will be given its world premiere. And a musical, theatrical adaptation of the Langston Hughes poem “The Black Clown” by the bass-baritone Davóne Tines and the composer Michael Schachter, will get its New York premiere. Those are among the highlights of this summer’s Mostly Mozart Festival, which will run from July 10 through Aug. 10 at Lincoln Center, and which is continuing to adapt and broaden its mandate since Lincoln Center stopped presenting its namesake summer festival last year. This summer’s festival, in addition to presenting classical concerts by the Mostly Mozart Festival Orchestra conducted by its music director, Louis Langrée, and more modern fare performed by International Contemporary Ensemble, will be centered around five large-scale, staged productions. “The Magic Flute” has been seen by more than 300,000 people around the world since its premiere at the Komische Oper Berlin in 2012, in a staging by Suzanne Andrade and Barrie Kosky featuring animation by Paul Barritt. It will be conducted in New York by Mr. Langrée and will run at the David H. Koch Theater from July 17-20. It will be the New York debut for Mr. Kosky, an Australian-born impresario who has injected new life into the Komische Oper as its artistic director and has directed Wagner’s “Die Meistersinger von Nürnberg” at the Bayreuth Festival, and who is staging Offenbach’s “Orphée aux Enfers” this summer in Salzburg. Three of the summer’s big-ticket items involve dance. The Mark Morris Dance Group will open the festival with “Sport,” its new Satie work, which will be paired with “Empire Garden,” set to Ives, and “V,” set to Schumann. “Blak Whyte Gray,” by the London-based hip-hop dance company Boy Blue, which was well-received last fall at the White Light Festival, will return. And “Under Siege,” a mixture of dance and martial arts by the Chinese choreographer Yang Liping, will get its United States premiere. “The Black Clown,” an adaptation of Hughes’s painful dramatic monologue of racism and oppression, earned strong reviews when it had its premiere last fall at the American Repertory Theater in Cambridge, Mass. It will run from July 24-27 at the Gerald W. Lynch Theater at John Jay College. This summer’s concert lineup will feature soloists including the violinists Joshua Bell, Vilde Frang and Pekka Kuusisto and the pianists Martin Helmchen, Pierre Laurent-Aimard and Steven Osborne. Gianandrea Noseda will return as a guest conductor. Ivan Fischer will conduct the Budapest Festival Orchestra in Mozart’s “Jupiter” Symphony and selection of Handel arias, and the Takács Quartet will perform Mozart, Beethoven and Dohnányi in a concert with the pianist Jeremy Denk.